Important legal information about the use of our website and our reservation policy. The Very Valencia site and brand are owned by Communication Common Ltd in England. As such, these terms and conditions are governed by the laws of England and Wales and will be interpreted in accordance with the English courts. The English courts shall have exclusive jurisdiction to settle any claim or dispute which might arise out of or in connection with these terms and conditions. By using veryvalencia.com you agree to be legally bound by these terms, which shall take effect immediately. If you do not agree to be legally bound by all the following Terms and Conditions, please do not access and/or use veryvalencia.com. Very Valencia may change these Terms and Conditions at any time by posting changes online. Please review these Terms and Conditions regularly to ensure you are aware of any changes made by Very Valencia. Your continued use of veryvalencia.com after changes are posted means you agree to be legally bound by these terms as updated and/or amended. Very Valencia offers a range of news and information through its website veryvalencia.com. While every effort has been made to ensure the accuracy of information on this site, we cannot accept responsibility for any errors. You may not copy, reproduce, republish, download, post, broadcast, transmit, make available to the public, or otherwise use veryvalencia.com content (inclusive of text, images, URLs, pricing information, etc.) in any way except for your own personal, non-commercial use. Any other use of veryvalencia.com content requires the prior written permission of Very Valencia (please click here for more information). You agree to use veryvalencia.com only for lawful purposes, and in a way that does not infringe the rights of, restrict or inhibit anyone else's use and enjoyment of veryvalencia.com. Your use of veryvalencia.com is intended for personal, noncommercial use and/or to make legitimate requests to book the products or services offered. You agree not to use this site to make any speculative, false or fraudulent requests. You agree not to use robots or other automated means to access this site, unless specifically permitted by Very Valencia. We grant you permission to use the site subject to the restrictions in these Terms and Conditions. In accessing or using the site, you may be exposed to content that is offensive, indecent, inaccurate, objectionable, or otherwise inappropriate. Very Valencia does not endorse such content, and cannot vouch for its accuracy. You therefore access and use the site at your own risk. We may collect the email addresses of those who communicate with us by email or the phone numbers of those who communicate with us by phone, text message or WhatsApp. These will only be used to contact existing or potential customers and for the purpose of providing advice and assistance. Reservation details including customer email addresses, phone numbers and accommodation names, may be shared with independent service providers so they can provide the service the customer has reserved. We may collect click-stream data and HTTP protocol elements through access logs. This information is not personally identifiable. We will only add you to our mailing list for news and offers about Valencia if you give us your consent, for example, through providing your email address when we talk with you on our website chat or by asking to be added to the list when filling in a reservation form on our website. We may place cookies on visitors' hard drives to collect information on the number of visitors to our site and the number of pages viewed. Cookie information is used only by veryvalencia.com and is not provided to any other organisation. It is used for traffic analysis and to provide relevant information to our visitors. We may use third-party advertising companies, including Google and Facebook, to serve ads when you visit our website. These companies may also place cookies on visitors' hard drives and use information (not including your name, address, email address, or telephone number) about your visits to this and other websites in order to provide advertisements about goods and services of interest to you. We use third-party social media plugins, including Disqus, to allow visitors to leave comments on our site. These companies may also place cookies on visitors' hard drives and use information (not including your name, address, email address, or telephone number) about your visits to this and other websites in order to provide relevant information to our visitors. Attempt to gain unauthorised access to the site, user accounts, computer systems or networks connected to the site through hacking, password mining or any other means; use the site or any site content to transmit any computer viruses, worms, defects, Trojan horses or other items of a destructive nature (collectively, "Viruses"); use any device, software or routine that interferes with the proper working of the site, or otherwise attempt to interfere with the proper working of the site; make excessive traffic demands; use the site to violate the security of any computer network, crack passwords or security encryption codes; disrupt or interfere with the security of, or otherwise cause harm to, the site or site content; remove, circumvent, disable, damage or otherwise interfere with any security-related features of the site, features that prevent or restrict the use or copying of site content, or features that enforce limitations on the use of the site. You may need to create an account and provide information about yourself in order to use some of the features on the site. You are responsible for maintaining the confidentiality of your account password. You are also responsible for all activities that occur in connection with your account. You agree to notify us immediately of any unauthorised use of your account. You can contribute to the site using Disqus, including writing reviews and adding comments (your "Content"). All content added using Disqus is subject to their Terms and Policies here. You alone are responsible for your Content. You assume all risks associated with your Content, including anyone's reliance on its accuracy, completeness or usefulness, or any disclosure by you of information in your Content that makes you personally identifiable. You represent that you own, or have the necessary permissions to use, and authorise the use of, your Content as described herein. You may not imply that your Content is in any way sponsored or endorsed by Very Valencia. Very Valencia may display advertisements and other information adjacent to or included with your Content on the site and other media. You are not entitled to any compensation for such advertisements. The manner, mode and extent of such advertising are subject to change without specific notice to you. 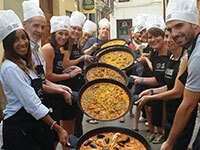 Very Valencia offers reservations of tours and other services (“products”) through its website (veryvalencia.com). Our Terms and Conditions contain important legal information and obligations and form the basis on which we accept reservations, so please read them carefully. Unless otherwise stated, reservations made through the veryvalencia.com website are subject to these Terms and Conditions and the person making the reservation shall be deemed to have accepted these conditions on behalf of everyone in the reservation. Variations to these Terms and Conditions will only be valid if made in writing with the authority of Very Valencia. We guarantee you the lowest price. If you book with us and then find the same product cheaper, let us know at least 48 hours before the service date and we'll refund the difference plus 10% of the difference. After checking it is an identical product available for the same time and date, we make the refund within 10 working days. Prices listed on veryvalencia.com are per person and in Euros, unless otherwise specified. Price quotations are subject to change without notice, until a reservation has been confirmed. Unless otherwise specified, prices include all fees and there are no hidden extras. Prices do not include European VAT (sales tax) nor will this be charged as Communication Common Ltd, the owners of the Very Valencia website and brand, is a company registered in England and Wales and is not registered for VAT. Prices do not include optional tips/gratuities. We provisionally confirm availability before taking any payment. Final availability is not confirmed until the payment is received. If the product is found not to be available we will let you know and offer you an alternative product or full refund. Deposits and payments are taken to guarantee your reservation. They are not refundable unless you are arriving on a cruise ship and it cancels its stop in Valencia, or, if the service is cancelled by us or the service provider (e.g. if a water activity tour were to be cancelled in the case of choppy seas). If you are on a cruise and your ship changes route and doesn't stop in Valencia, or if we or the service provider have to cancel your reservation for any reason, we will refund your deposit or payment, in full, within 5 working days of the reservation date. If you are on a cruise and your ship changes the date it stops in Valencia, we will reschedule you for the new date, or, if there is no availability, we will refund your payment, in full, within 5 working days of the reservation date. In some cases we may require written evidence from the cruise line confirming your itinerary was changed by them. Payments through the Very Valencia website are accepted by Visa, MasterCard or American Express credit or debit card. Payments for reservations made by phone, email, text message, WhatsApp or our website chat, are accepted by Visa, MasterCard or American Express credit or debit card, PayPal or bank transfer. Visa, MasterCard or American Express credit or debit card payments will show on your account veryvalencia.com. PayPal payments will show as being made to Communication Common Ltd and/or PAYPAL - CCTOURPAY. Additional ID may be required from the cardholder for Visa, MasterCard or American Express credit or debit card payments and part-payments, made for reservations with a value of €250 EUR or £250 GBP or more, for fraud prevention reasons. If you cancel or don't arrive by the meeting time on your E-ticket and miss the tour, activity or service, you will not receive a refund, except if you are on a cruise and your ship changes route and doesn't stop in Valencia. All payments will be made to Communication Common Ltd in the United Kingdom, the owners of the Very Valencia website and brand. Occasionally our suppliers and/or service providers make changes to tour dates, prices, inclusions, coverage, age requirements, etc. As a result, Very Valencia reserves the right to cancel, change or substitute any service, tour, ticket or product that you have booked at veryvalencia.com, at any time, for any reason. In such cases, if you are dissatisfied with the alternatives offered, you are entitled to a full refund of what you have paid. We make very effort to ensure all information about the tours, activities and services we offer is correct. However, if anything is different to how we described it when you take the tour, activity or service, let us know in writing within 48 hours and we will consider making a partial refund proportional to the effect of the changes. Requests for changes to reservations must be directed to the Very Valencia using the contact information here or by replying to one of the emails you received from us. We will then process the request. Changes to the reservation date/time or other details (e.g. tour version or number of guests) will be made subject to availability, but there is no guarantee and a minimum administration fee of €20 EUR will be charged for any successful changes. If you are on a cruise and it changes the date it is due to stop in Valencia we will change your reservation to the new date, for no extra charge. If there is no availability for the new date we will offer you a different product or a full refund (see Payments and Cancellations). When we act as an agent making a reservation with an independent service provider the name of the service provider will be clearly stated on the reservation E-ticket. While we select who we work with carefully, Very Valencia makes no representations or warranties of any kind regarding independent service providers or their services. When receiving confirmation of a reservation with an independent service provider, customers acknowledge and agree that, in addition to Very Valencia's standard Terms and Conditions, Very Valencia nor its agents are liable for any accidents, losses, injuries, damages, delays, expenses due to any action or inaction on the part of the service provider or their services. If for any reason you do not want a reservation with the service provider we have confirmed you can contact us within 48 hours (or up to 48 hours before the service date, whichever sooner) using the contact information here or by replying to one of the emails you received from us. We will then offer you the same service with another provider or cancel and refund any payment you have made in full. Boat trips and charters are dependent on the weather, but will go ahead rain or shine, as long as the captain considers it safe to do so. It is your responsibility to check the weather and bring suitable clothing. Bear in mind it can often be cooler on the water than on the land. If you decide to cancel the boat trip or charter due to the weather then no refund will be given (see also Availability, Payments and Cancellations point 7 above). If you are concerned about this we recommend you buy travel insurance that covers you for such eventualities. On sailing boat trips and charters, the captain will only use the sails if he/she considers the wind to be suitable, otherwise you will sail with the motor. On boat trips and charters on the sea, the water is typically quite calm but we recommend that those prone to seasickness take motion sickness medication as recommended by a qualified medical professional or pharmacist, and refrain from drinking alcohol during the trip. For safety reasons you must consume alcohol responsibly on the boat and do as the captain/crew indicate at all times. Failure to do so will result in the service being immediately terminated without refund. We are happy to give advice to cruise ship passengers and have never had a customer miss a cruise ship departure, but ultimately it is your responsibility to make sure you will arrive in time for your reservation and get back to your ship in time for its departure. We recommend that you arrive back to your ship at least one hour before it departs. E-tickets are required for all reservations and you must read them carefully. They contain important information including directions and local contact details. We send you your E-ticket after you've paid or made a deposit for your reservation, your reservation is not confirmed until your E-ticket is issued. You must bring a copy of your E-ticket with you on your phone or other electronic device, or printed out. It is your responsibility to take your E-ticket with you. If you don't receive your E-ticket you must contact us and we will re-send it. Under no circumstances will Very Valencia or its agents be liable for any of the following losses or damage (whether such losses where foreseen, foreseeable, known or otherwise): (a) loss of data; (b) loss of revenue or anticipated profits; (c) loss of business; (d) loss of opportunity; (e) loss of goodwill or injury to reputation; (f) losses suffered by third parties; or (g) any indirect, consequential, special or exemplary damages arising from the use of veryvalencia.com regardless of the form of action. Very Valencia in making reservations for tours, car rentals, transportation or any service in connection with the itineraries of individual customers, shall not be liable for injury, damage, loss, accident, delay or irregularity, liability or expense to person or property due to act of default by any service provider or other company or person providing services included in the reservation. Furthermore, Very Valencia accepts no responsibility for any sickness, pilferage, labour disputes, machinery breakdown, government restrains, acts of war and/or terrorism, weather conditions, defect in any vehicle of transportation or for any misadventure or casualty or any other causes beyond their control. Very Valencia’s content - including the information, names, images, pictures, logos, prices, dates, and availability regarding or relating to Very Valencia and/or service provide is provided “AS IS” and on an “AS AVAILABLE” basis without any representations or any kind of warranty made (whether express or implied by law) to the extent permitted by law, including the implied warranties of satisfactory quality, fitness for a particular purpose, non-infringement, compatibility, security and accuracy. At Very Valencia we check and recheck the details about all the products and services we offer for accuracy. However, Very Valencia does not warrant that functionality, content or information contained on veryvalencia.com website will be uninterrupted or error free, that defects will be corrected, or that veryvalencia.com or the servers that make it available are free of viruses or bugs. Gift certificates are only valid for services sold directly by Very Valencia, not third-party vendors such as Viator. Reservations made with gift certificates are subject to availability. Gift certificates can be applied towards reservations of a greater value than the credit value, with the difference being paid separately, but if the reservation value is lower than the credit value change cannot be given. In the unlikely event of a reservation being cancelled by us or the service provider, the refund of the certificate value will be made in the form of another Very Valencia gift certificate. Normal tour Terms and Conditions still apply for reservations made with gift certificates. Very Valencia reserves the right to cancel gift certificates obtained fraudulently. Very Valencia is not responsible for stolen or lost gift certificates. All gift certificate sales are final and are not refundable. These Terms and Conditions were last updated on Tuesday, 2 April 2019 at 12:26pm UK time.